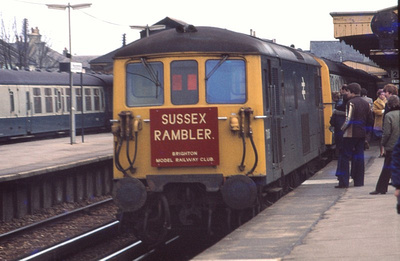 Back in the dim and distant past......well the 31st of March 1979 The Brighton Model Railway Club had its first and only foray into the world of railtours with the Sussex Rambler. This page is dedicated to that "one off" and features photographs and memories from the trip. Many thanks to Six Bells Junction for the timings reproduced here. They also note the train ran to time throughout! Here are a few photographs of the trip. Click on the pictures for a larger image. Brighton station - the name board is being fitted, 3rd person in the line on the platform is Les Chatfield, club member and now retired BR engineer. Just after departing Lewes we round the curve at Southerham Cement works. The cement works is long closed, now an industrial estate although you can easily see where it was and there is still some track in situ for the sidings just by the A27 Lewes bypass bridge at Southerham. With the 4TC now leading its a few minutes before departure from Seaford back to Newhaven Harbour and yet another reversal to access Newhaven Marine. Seaford now only has one platform face in use and the sidings are long gone. A carpark covers the site to the right of this photograph. Newhaven Marine, time to change ends for the run to Haywards Heath. The Marine station is now only served by a "Parlimentary train" and due to the condition of the building this is currently running from the Harbour station. It wasn't the best day for photography overcast and wet. 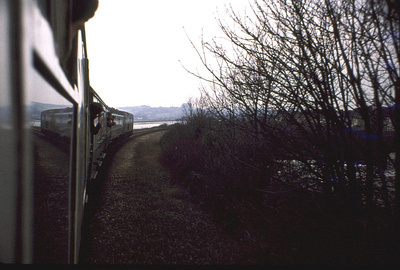 73126 heads up the river Adur towards Beeding Cement works the end of the line. 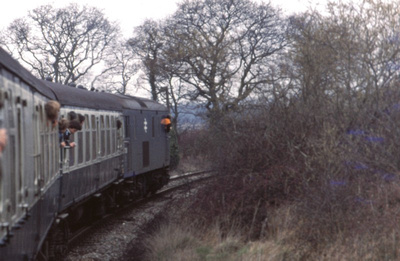 This was the last ever passenger train to use the line. A footpath is now on the former trackbed. Lavant here we come. At this time the service at Lavant was approx 5 round trips from the Francis Parker gravel loader to Drayton on the east side of Chichester. Here the gravel was unloaded into a lake to be washed. The wagons used were unique French built side discharging bogie hoppers that were heavily route restricted. They could only run between Lavant and Drayton and to Eastleigh for repairs. They were scrapped in Chichester yard when the quarry shut and the line finally closed. 73126 at Littlehampton, The station had a major rebuild in the late 1980's. The sidings and depot were also remodelled a few years ago for the introduction of the class 377 fleet. The Sussex Rambler name board still graces our club rooms.